Blow up Garden Pouffes - Kiwi or Sunflower waterproof & washable RRP £30..! Lounge Chair L84 X W84 X H 70cm. Light Grey. Multi-functional inflatable bed and sofa. Sturdy coil - beam construction. Heavy duty repair patch included. Comfortable flocked surface. However, we are human and should there be any problem with an item bought from us. or you just decided that you don't want it! Benross presents this fantastic inflatable multifunctional sofa bed. A coil-beam construction provides excellent support for the body. A convenient folding design for different functions including: double sofa, double lounge, 1-layer double bed, double bed w/back rest, 2-layer single bed. INTEX®INFLATABLE BLOSSOM LUXURIOUS SEAT / CHAIR FOR KIDS. 1 x Intex® Inflatable Chair (without pump). Our inflatable blossom chair is a great way to relax and play in style. Finally an inflatable chair that is versatile enough for indoor and outdoor use.This contoured seat has a durable 2-ply reinforced bottom for long-lasting durability. Fantastic, fun and durable black PVC recliner bean bags. Very well made, strong stitching and thick fabric. We've lost a few beans along the way, but a top up (they're very inexpensive) will make them super comfortable. Intex Beanless Chair. Intex Beanless Bag Chair in neon green. Use as a gaming chair or in a childs bedroom. Colour: Green. Sport & Leisure. Outdoor & Garden. Children's Toys. Health & Beauty. FAUX LEATHER BEANBAG. FULL SIZE ADULT 10 CUBE BEANBAG CHAIR. TO VIEW ALL ZIPPY PRODUCTS FOR SALE. DESIGNER MODULE CHAIR. EASYCARE - WIPE CLEAN - FAUX LEATHER. This sale is for 1 x chair with beans. CHOOSE ONE SOLID COLOUR. Sit back and relax in the new Vango inflatable lounger. Flocked surface for added comfort. Coil beam construction gives support and strength. 2 layer in height - easier to get up from. However, we are human and should there be any problem with an item bought from us. or you just decided that you don't want it! BY ZIPPY UK LTD. ZIPPY UK LTD. FAUX LEATHER BEANBAG. FULL SIZE ADULT 10 CUBE BEANBAG CHAIR. TO VIEW ALL ZIPPY PRODUCTS FOR SALE. DESIGNER MODULE CHAIR. OR A TWO COLOUR CHAIR. EASYCARE - WIPE CLEAN - FAUX LEATHER. 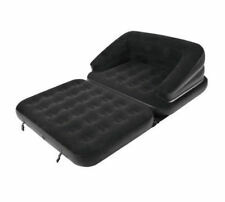 Inflatable Sofa Air Bed Lounger Chair Sleeping Bag Mattress Seat Couch Camping. 1 x Bag Holder. 1 x Sleeping bag sofa. - Color: see drop down box. - Size: 230 x 70cm. - Weight Support: 220kg. - Material: Nylon and PVC. Fill up to 80%，roll up the seal inwardly, tie up, seal and fasten it. Repeat filling the air operation. - Put up using just the air around you within a minute and put down again by letting the air out in seconds. Put up using just the air around you within a minute and put down again by letting the air out in seconds. - Weight Support: 220kg. - Color: see drop down box. - Size: 230 x 70cm. - Material: Nylon and PVC. 84cm H x 72cm W x 72cm D. Crafted from faux leather, this bean bag chair creates the perfect inviting spot to lounge with a book in the study or perch while entertaining guests in the living room. Bean filling included. Good communication is the best way to solve any issues, we will try our best to solve it well. Color: As picture. Size: As picture. Waterproof flocked surface provides soft velvety feeling and adds to comfort. Good communication is the best way to solve any issues, we will try our best to solve it well. Color: As picture. Size: As picture. 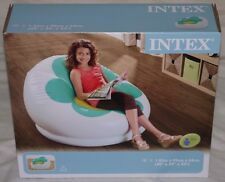 Inflatable Air Sofa Lounger Chair with Rest Footstool and Pump. Footstool: approx. Length 63cm x Height 29cm. 1 x Footstool. 1 x Inflatable Sofa. Sofa Size: approx.125cm x 100cm x 85cm. Multi-circle at the bottom, prevent sliding, safe and comfortable. Simple, Affordable, Stylish Bean Bags. Flexible And Moulds To Adjust To The Shape Of The User'S Body, High Back Support And Is Light Weighted. BEAN BAG COVER ONLY WITHOUT BEANS. Covered in soft durable leatherette, trendy and comfortable seating that's great for all ages, double stitched and zippers for added strength and safety, note - only covers (without Beans). BEAN BAG COVER ONLY WITHOUT BEANS. This XL bean bag cover requires 1.5 kg of beans. Material: High End Leatherette. A great beanbag without the hassle of beanbag inserts and slipcovers. Simply unfold, inflate and within minutes you have a super soft bean bag that is perfect for lounging, studying or watching movies. Inflatable Football Chair. This chair is great for relaxing both indoors and outdoors. If you are having a football night what better way is there to seat your guests?. Width: 108cm. This inflatable chair, with space for two people, is perfect for all your outdoor activities! Double Inflatable Chair. We go above and beyond to ensure you receive the best level of service. Colour Box. They are quickly deflated for longer distances and convenient storage. Inflatable loungers are lightweight and present no trouble to move from room to room. We go above and beyond to ensure you receive the best level of service. Put your feet up too, with the multi-purpose second stool part. - Inflatable loungers are lightweight and present no trouble to move from room to room. They are quickly deflated for longer distances and convenient storage. This easy to use inflatable air chair with an added cup holder allows you to kick back and relax with no hassle. 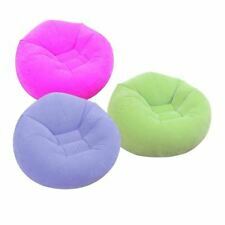 Inflatable chair with comfortable flocked surface made from sturdy pre-tested vinyl for durability and quality. Good communication is the best way to solve any issues, we will try our best to solve it well. Pattern: Dot. Color: As picture. Size: As picture.